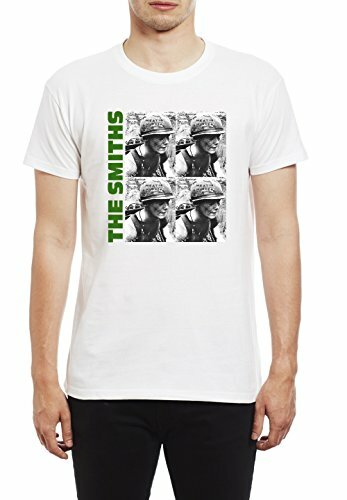 If you were asked to name one of the most influential British bands of the 80s, then The Smiths would certainly be in the top five for a good many of you, I would imagine. 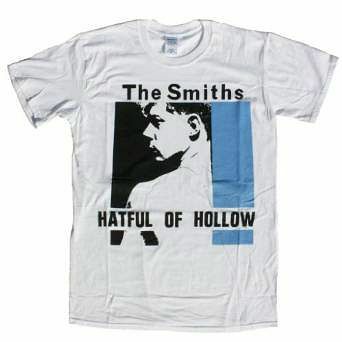 The alternative rock/Indie pop band from Manchester may have only been active for five years (1982-87), but in that relatively short period they managed to create a pretty substantial following. 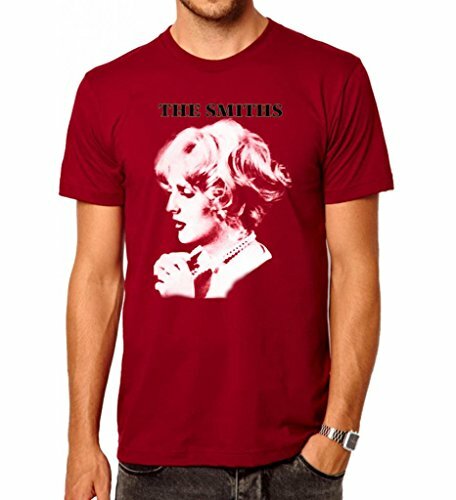 The band still appear to have a big fanbase judging by the number of T-shirts that are sold through my website simplyeighties.com. 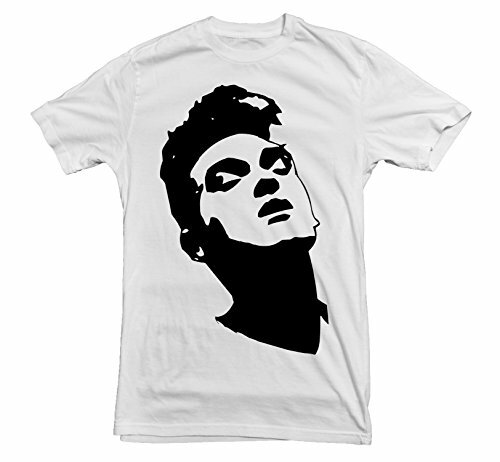 Amazon UK have an extensive range of designs, including the most popular Tee featured at the top of this page, as well as designs adorned with the band's frontman Morrissey. 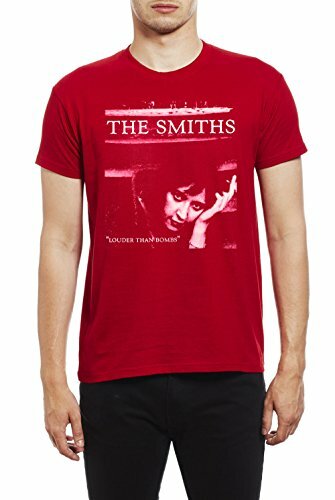 If you're from the U.S. then you'll be delighted to know that Amazon.com stock a range of Tees, too, although it's not as ample as the UK store. 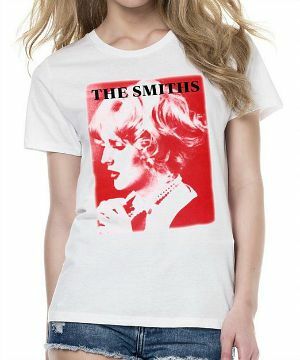 A more substantial range of brand new, "Buy it now" T-shirts can be found at ebay, although, once again, if you're browsing in the British Isles then you're probably going to see a bigger range of designs. Many quality suppliers sell their wares through ebay these days, so you'll probably be able to pick up a bargain here. 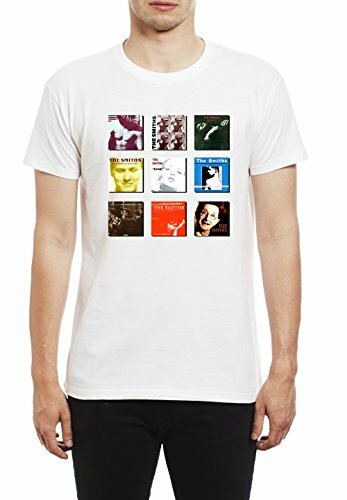 If you would like a more quirky design than the more popular choices, then try a search for the newest arrivals at Amazon UK as this usually throws up a few different ideas. I've hand-picked my favourite designs below. 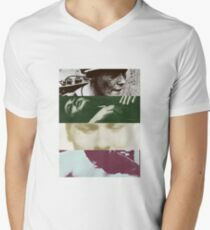 Please note that you can find the designs printed on a full range of T-shirts and other items by scrolling down the page on the site. 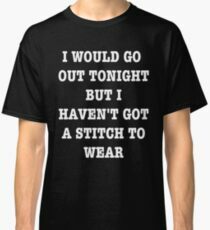 The "I would go out tonight but I haven't got a stitch to wear" Charming Man lyrics T-shirt is particularly amusing. 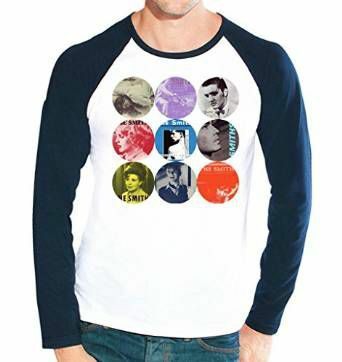 This baseball shirt features nine vinyl record covers and offers something a little different to the standard short-sleeved shirts. 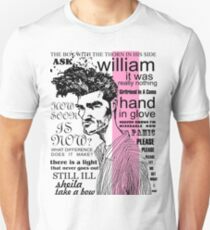 It's sold by a company calling themselves Morrissey and The Smiths at Amazon (they sound official, although I have no idea whether they are or not) and they have three pages of high quality merchandise including heavy weight shirts, bags and posters. 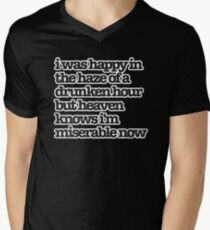 This ladies heavyweight T-shirt is one of many designs being sold by the aforementioned Morrissey and The Smiths company. Now, just about any fan of The Smiths will, no doubt, remember that performance on The Tube in 1984 where Morrissey can be seen with a bunch of daffodils in his back pocket. 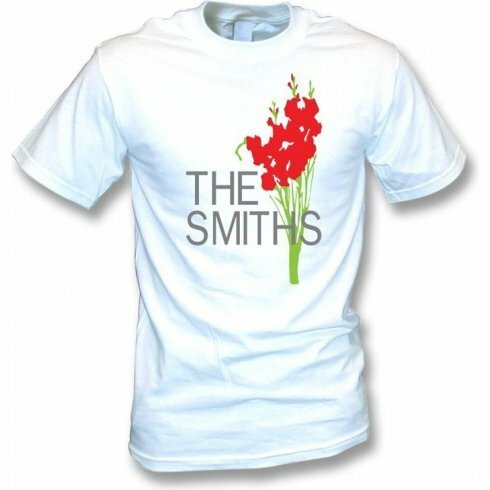 Therefore, this shirt featuring daffodils is a nice touch. Well, I hope I've provided you with some decent designs. 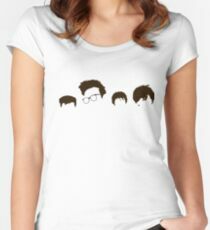 You can see many more retro rock and pop band T-shirts ideas at my website.